Free Inbound Marketing Resources, Really? We all know that the best things in life don't come easy, but what we also know and believe in is the fact that the best things in life don't always come with a price. This mantra rings true especially when it comes to downloading royalty free stock images we desperately need to bring that extra flavor to our website, blog or social media profile. As an active marketing company, we have tried a million times to search and download the images that we end up seeing as available for purchase on premium stock photography websites at an unbelievably high price. This often makes our image search futile since we cannot get that stock photo for free or even if we do spend a minimum of £5 (or more likely $5) we only get to download the image in a simple non-HD jpeg version. Premium stock image sites have free stock photos available to you only when you sign up for their membership plans, which are charged monthly or annually or you can download any 5 stock images of your choice for $25, which is pretty expensive for millions of users on the Internet. 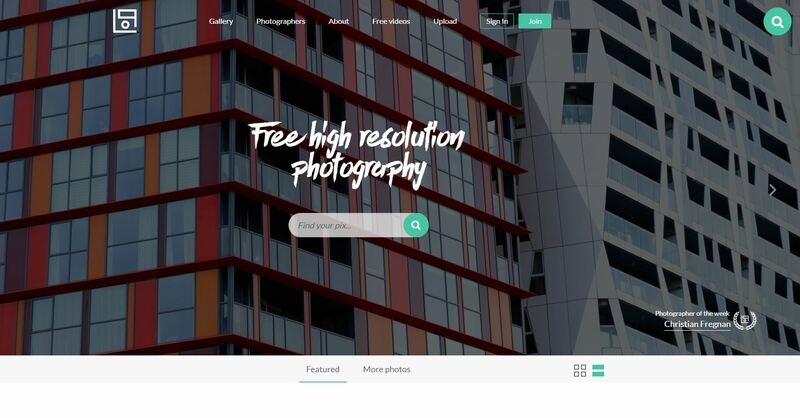 Whitehat has curated a list of top royalty free stock images websites where you can get high quality stock images absolutely free. You do not have to pay for your membership, you can simply sign up on either of them, search the images you want for your website, design project or blog and download them in HD quality without any hassle. Whether you are a website designer, business owner, artist or passionate blogger, you will get the images you want without paying a cent. Pexels is another stock photo haven providing incredibly fresh and awe-inspiring, high resolution stock photos. With at least 3,000 brand new images added each month. The developers at Pexels ensure that the site caters to all visitors, therefore, it hosts a variety of free stock images, all hand-picked to suit the needs of all its visitors. All images on Pexels have Creative Commons Zero license, which enables them to be downloaded, modified, and distributed without permission and are available for personal and commercial use. With it's quick search bar on top of the website, it is easier to find the perfect image for your website instantly, making it super easy for you download high resolution images for your inbound marketing project. Unsplash offers +500,000 free high resolution stock images absolutely free to its visitors, with the motto ''do whatever you want''. The images on Unsplash are very unique and have an original feel that you will not find on any other free stock photo website. The best feature about this website is that all the photos published on Unsplash are licensed under Creative Commons Zero, providing users absolute freedom to download, edit or distribute the images without any attribution or permissions. Rawpixel is founded with a passion to redefine stock imagery and to create design resources that reflect today’s society. They have over 20,000 exclusive high-quality free images, vectors and mockups. These are increasing at a speed of light. Each week, they will also make one premium collection of images free. Rawpixel has a lot of business, community and people images and they are working hard to capture diversity in their images. If you are looking for images with great concept, Rawpixel could easily become your go-to choice. The free plan includes a maximum of 100 monthly download from their free collection, but if you want more there is also a Premium Membership for 29$/month that gives you unlimited downloads from their entire Premium collection for commercial use. 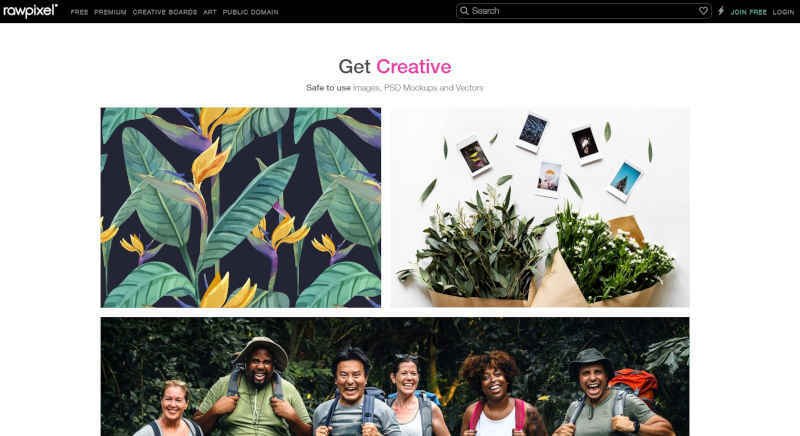 Picjumbo has proved to be a stock photo haven for thousands of creative people who visit the website daily to download hundreds of royalty free stock images in HD. The site was created in 2013 by designer and photographer Viktor Hanacek. It all started when all of the regular stock photo sites rejected his photos for "lack of quality". Two years later, people have downloaded more than two and half million pictures from picjumbo! 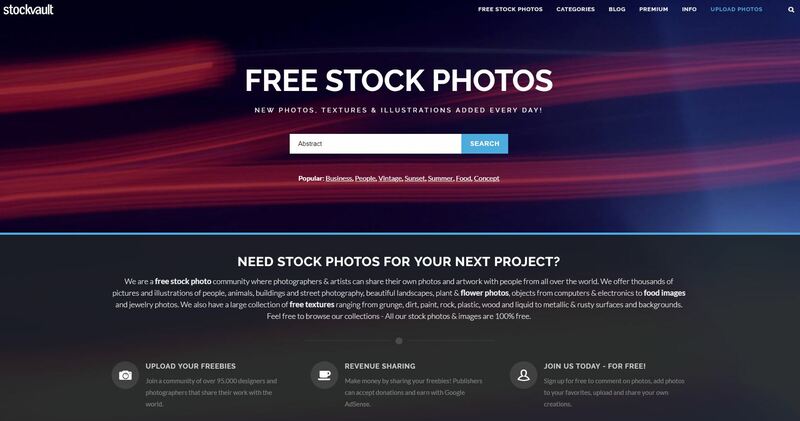 Right now it’s one of the most popular free stock photo sites with more than 1 million views every month. And because almost all photos are made by Viktor, you can support this project by purchasing the All in One Pack where you can get direct download of all (2000+) published images. They also have PREMIUM Membership where you can get never published exclusive photos and all images from their photoshoots. Gratisography is a project of acclaimed photographer Ryan McGuire and probably the world’s quirkiest collection of high-resolution free stock images, comprised of the world’s best, most creative pictures. Images you just won’t find anywhere else. Through this project Ryan has made available one of the most visually appealing and creative photographs that are available absolutely free for download. Unlike the other sites, Gratisography takes a different approach. They're not after quantity but instead they’re pretty choosy when it comes to the images they publish in their collection, trying to always choose the most interesting pictures, the ones with a personality, a perspective, a story to tell. So, if you are looking to add a creative and sophisticated touch to your project, Gratisography is just the place for you. Life of Pix is a royalty free images resource created by a Montreal-based creative agency by the name of LEEROY Advertising Agency which has a network of extremely professional and talented photographers who publish high-resolution photos on the website on a weekly basis for free download without any copyright restrictions. New pictures are added weekly. Life of Pix has come up with an interesting video project called Life of Vids, where videos, clips and multiple loops can be downloaded for free. The videos have no copyright restrictions and are free to download, modify and distribute. Burst is a free stock photo platform that is powered by Shopify. The image library includes thousands of high-resolution, royalty-free images that were shot by its community of photographers. Their library includes 1000’s of high-resolution images shot by a team of in-house photographers and a global network of contributors. Images are free to use for any personal or professional project (an e-commerce store, client work, school projects, etc.) with no attribution required. Although they do appreciate photographer credit whenever possible. Photos can be downloaded in both a web-friendly version (which is meant for online use) and a high-quality version (which can be used for any print and large-scale projects). There is also a page called "Business Idea" there there are free photo collections and case studies that empower you to start your own business following the trending business ideas. 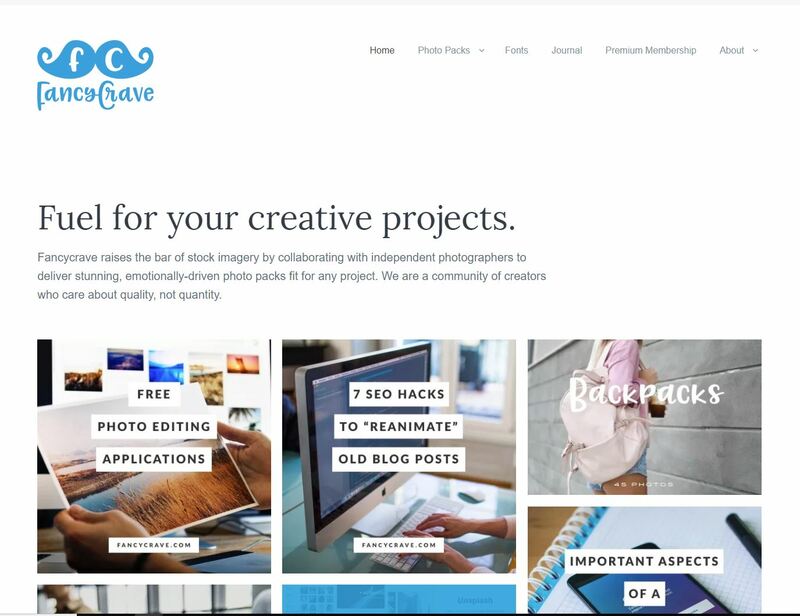 Fancy Crave is one of the most popular royalty free stock image websites, with absolutely no copyright restrictions. It's an online resource providing free public domain photo packs. The images are high-res and taken by professional photographers. The only condition Fancy Crave asks is to give credit to the photographer wherever the image is used. Providing attribution is not only nice but a nice way to appreciate a photographer's work. Fancy Crave also offers a Premium Membership for $9.99/month that gives you instant access to the whole library consisting of 18+ collections with 900+ images. Kaboompics offers a huge collection of high resolution, stock free images covering a variety of scenarios, such as fashion, landscapes, food, architecture and even abstract. Karolina, is the creative genius behind this project. She is a Polish web designer who came up with the idea of providing free stock images to bloggers, freelancers, website owners, small businesses by giving them the freedom to browse through Kaboompics and download images in high-res. All Karolina asks users is to give her photo credit and a link back to Kaboompics which will help grow her website. Canva is known by many as an easy and practical online software for creating quick and great design images, perfect for sharing on social media or on your blog. 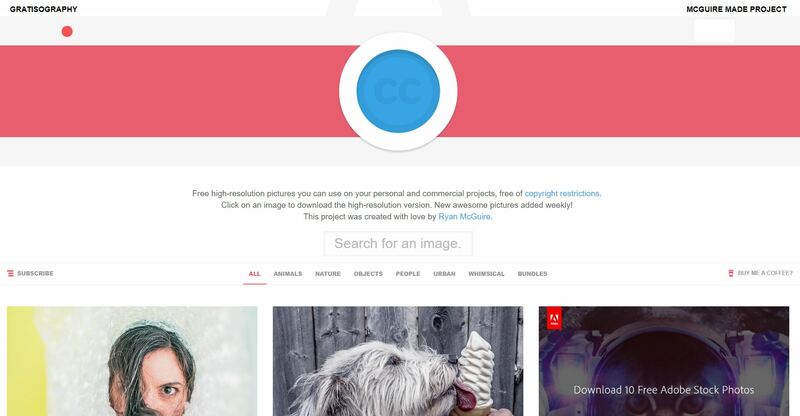 But maybe not everyone knows that Canva has also a free stock images collection that you can use for your next design. To find them you can simply type "free photos" con the website search bar and you'll be shown just the free photos available. 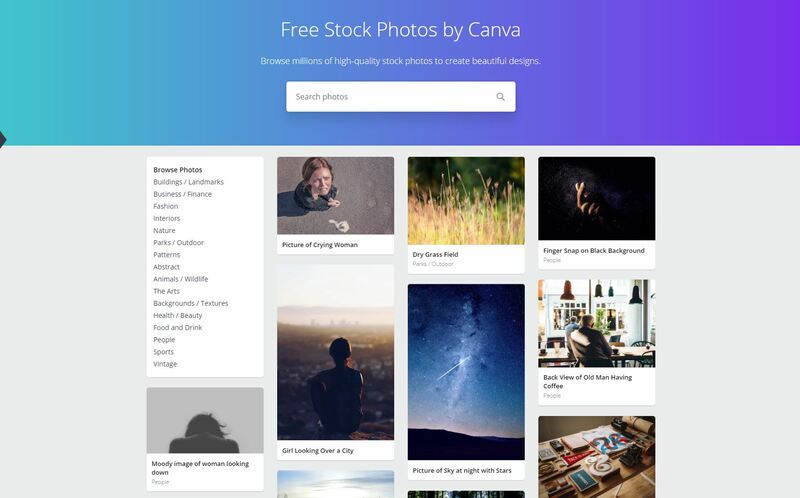 Canva offers more than 1,000,000 free and premium stock photos, illustrations and icons that users can use in their designs. Users can also search through our huge library of templates and edit them to make them truly their own. Pixabay is one of the biggest resource for copyright free stock images and video, all released under Creative Commons CC0, so you can use and modified them without asking for permission. Its collection is incredibly huge, with more than 1,4 million materials for personal and business use, you will surely find the one you need that perfectly fit with your campaign. Curious is the filter in the search bar that allows you to explore images based on the camera used to take them, perfect if you are a professional photographer and you already know what kind of quality you're looking for. 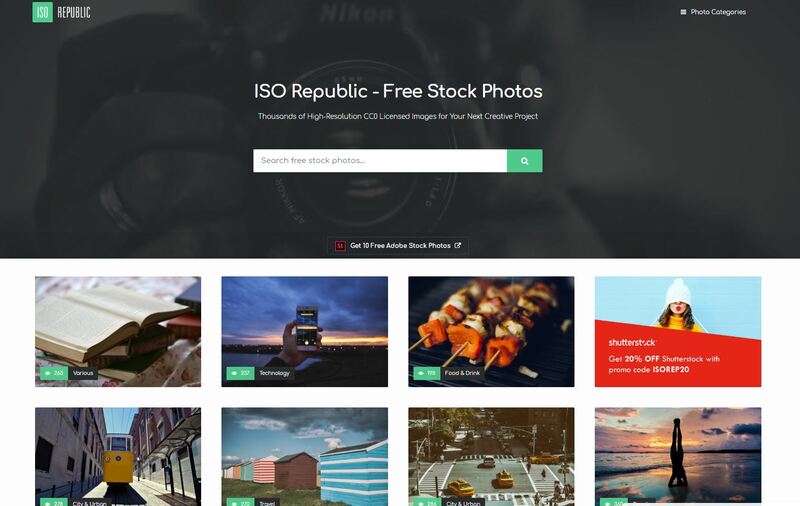 ISO Republic is a supplier of free stock images for creative professionals, bloggers, designers, marketers, with thousands CC0 photos already published and more of them added every week. To make the image search easier these are sorted into many different categories, included Architecture, Nature, People, ect. ISO Republic also recently launched a new project called "Foodie Factor", a new website dedicated to food and drink free stock photos. So, if you want some tasty images for your campaign it would be worth checking this site too. Stockvault is a brilliant resource for copyright free materials and it offers more than 120,000 free stock photos with hundred of new images added every week from photographers, designers and students around the world that joined its community. Whether you are a free or premium user, you have access to a huge library of photos to use anywhere you want. The site also has a selection of Photoshop tutorials, covering different manipulation technique, and an internal Blog where to look for advice and inspiration for your campaign. Pikwizard is a great new stock photography website with over 100,000 high-quality images. 20,000 of these are completely exclusive to Pikwizard. The website prides itself on its high-quality images of people, which are few and far between on stock photography websites. The website also features beautiful image categories such as desktop backgrounds, fantasy landscapes and forest backgrounds. There is no attribution required on Pikwizard. It also features an excellent design tool called Design Wizard, which allows you to personalize an image from Pikwizard in seconds." Share them immediately to social media or schedule the publication (thanks to the Buffer, HubSpot and Marketo integrations). The platform provides 17,000 templates (10,000 free) to choose and it has over 1.2 million images in the database. Design Wizard trump card is the price: their licensing has a low-cost model and all of the tools features are available in the free subscription, unlike most of their competitors. The Pro version costs 9.99 dollars per month and grants to the user a larger storage space and a customer service. The Expert version ($ 16.95) adds a Priority Support and a Dedicated Account Manager. Do you know of a better site for free images? Let us know by posting a comment below. Or if you have some feedback on the sites above, comment and share your thoughts. We will take everything into account when we do our next review. If you are looking for some more resources for your Inbound Marketing campaign, then go to our free resources page: www.whitehat-seo.co.uk/inbound-marketing-resources You will also find multiple success strategies that will make your business prosper. Want some ideas on what really work on the web. Take a look at this..